HAVE BECOME MY EVERYDAY JEWELRY. EVERY PIECE FROM THEIR COLLECTION IS TIMELESS AND CAN EASILY BE LAYERED OR WORN JUST ON IT'S OWN. 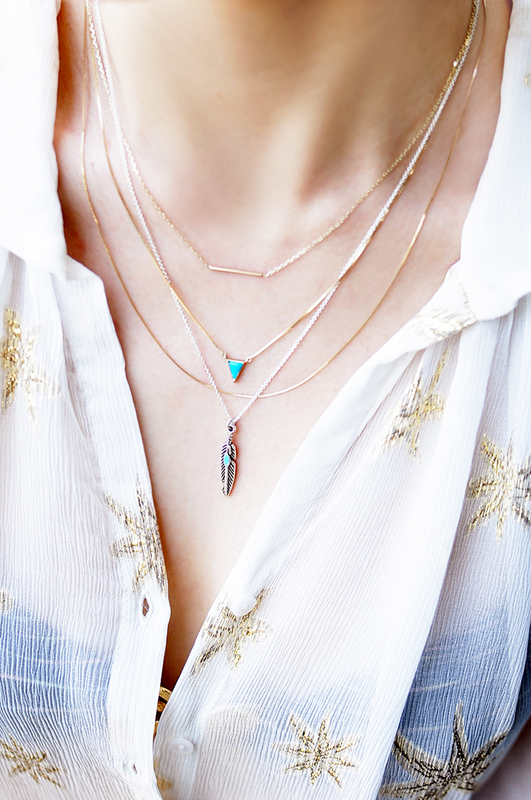 JEWELRY PLAYS A BIG ROLE IN COACHELLA FASHION, WHICH STARTS THIS WEEKEND. SO, WITH COACHELLA COMING UP, I'VE TEAMED UP WITH GJENMI FOR A GIVEAWAY! YOU DON'T HAVE TO BE GOING TO COACHELLA TO PARTICIPATE IN THE GIVEAWAY, BUT IF YOU ARE THIS WOULD BE A GREAT PIECE TO ROCK AT COACHELLA. SINCE THERE ARE 2 WEEKENDS FOR COACHELLA GJENMI HAS OFFERED TO DO 2 GIVEAWAYS! THIS WEEK'S GIVEAWAY WILL BE THE FEATHER NECKLACE. THIS GIVEAWAY WILL END 4/10/14 11:59PM PST. THIS GIVEAWAY IS FOR US READERS ONLY.